One of the most important traits we’ve developed over the course of human evolution is our exceptionally large brains. Brain size is one of the key factors that determines a primate’s intelligence (Deaner et al., 2007) and the human brain is 7 times bigger than it should be for an animal of our body size (Marino, 1998). For contrast, the average primate brain is only 1.9 times bigger than it should be (Aiello & Wheeler, 1995) and primates are far from stupid. So why did we evolve such large brains? Given the many advantages that stem from intelligence, the answer seems obvious: being smart is great, so those with bigger brains were selected for. However, that’s not good enough for science! “Intelligence” is a rather vague term and there are some drawbacks to having large brains, including their increased energy requirments (Marino, 1998) and the difficulties associated with giving birth to a large head (Trevathan & Rosenberg, 2000). We want to find out what was the specific benefit of large brains – sufficient to outweigh the downsides – that drove their evolution. Robin Dunbar believes it to be the size of our groups. Dunbar was originally a primatologist and he discovered that there was a correlation between group size and brain size. He concluded that the benefits of a large group – such as more allies to help search for food, look for predators and defend territory – selected for larger brains which would allow an individual to remember and maintain more social relationships. He termed this the “social brain hypothesis.” (Dunbar, 1993). Subsequent research (a lot of it by Dunbar) has vindicated this idea, repeatedly demonstrating a link between brain and group size (Dunbar, 2003). Additional lines of inquiry also help explain why this may be the case. For example, Gutison et al. (2012) noted that primates which live in larger social groups typically have a more complex range of vocalisations (likely to deal with the larger range of social interactions they encounter). Being able to generate, remember and process all of these calls is probably one of the reasons they need larger brains. The social brain hypothesis is a very useful explanation for hominin encephalisation (encephalisation being the fancy science word for brain growth), because it gives us the ability to predict the group size of our ancestors. You can use the correlation between brain size and group size established from living animals to estimate the group size of extinct ones from their cranial capacity. These predictions have been the basis for a lot of research into the social lives of our ancestors, including work which estimated when language must have arisen. This research (once again involving Dunbar) noted that primates have to groom each other to reinforce social bonds. The amount of time spent grooming increased with the number of social bonds they had to maintain (i.e. the size of the group). However, they found no primate could spend more than 20% of their time grooming; the rest of it being taken up by feeding, sleeping etc. Thus when human groups got so large they would not have had enough time to groom each other, they must have started using something else to reinforce social bonds. They believe this was language (Aiello & Dunbar, 1993). Despite the strong evidence in favour of the social brain hypothesis it likely wasn’t the only factor responsible for hominin encephalisation. This is because environments are very complicated, so there’s rarely just one factor driving the evolution of a trait. In the case of our large brains, one of the major other factors was environmental variability. The “environmental complexity hypothesis” is the product of a range of researchers examining a variety of species all arriving at the same conclusion: a variable environment will select for a versatile species able to survive in a range of conditions. This is because they can adapt to new environments quickly, without having to wait for evolution to change them. Crucially, one way in which an animal can become versatile is by developing a large brain. This allows them to come up with innovative, new behaviours (and sometimes technology) to help compensate for any environmental change they may encounter. Most research into this comes from birds, since you can compare migratory (who follow one environment around the world) and non-migratory (who encounter a range of environments) species. As the environmental complexity hypothesis predicts, non-migratory birds tend to have bigger brains (Sol, et al. 2010) and also innovate more often (Sol, et al., 2005), showing their ability to adapt. This is also true of mammals, where brain size can be used to predict their ability to survive in new environments11. So the big question is whether or not our ancestors evolved in a variable environment? In a word: yes (Grove, 2011). Our genus, Homo, appeared ~2.4 million years ago and has been the taxon which has seen the largest amount of brain growth. When you look at environmental variation over the past 5 million years, you see it increases dramatically around the time Homoappears and continues to get more severe as our brains continue to get bigger. One of the major factors responsible for this climate variation is the way the earth’s orbit varies over time. Over hundreds and thousands of years it changes between being more and less elipical (known as eccentricity), more and less tilted towards the sun (known as obliquity) and more or less “wobbly” on its axis (known as precession). Yes, those are all technical terms (not). These “Milankovitch cycles” naturally influence the earth’s environment. The severity of the tilt towards the sun, for example, influences the severity of seasons. Importantly, these cycles are regular but each one is a different length. The variation in how elliptical the orbit is changes over 100,000 years or so ago whilst the “wobble” changes over the course 21,000 years. As such they sometimes occur at different times but will sometimes align, amplifying each other to create especially severe environmental variation. The especially variable period which triggered the growth of our large brains is the result of such an alignment (Grove, 2012). There were obviously other factors which prompted encephalisation too. For example, as co-operation became more important so did our ability to detect cheaters (and cheat), which would’ve selected for large brained individuals able to remember cheaters or lie better. But at the end of the day, most of these other driving forces stem from our social groups and environmental complexity. The advantages of complex tools may drive the evolution of large brains to create them, but we need such tools to help us become versatile and adapt to environmental change. These benefits allowed our ancestors to be more reproductively successful, spreading the genes for larger brains throughout the population so all future generations had this advantage. The brain increased in size again at some point, amplifying these advantages and so it was spread throughout the population again. This kept happening, resulting in a gradual growth in brain capacity over time until we wound up with the nogin we have today. Aiello, L.C. & Dunbar, R.I. 1993. Neocortex size, group size, and the evolution of language. Current Anthropology, 34: 184-193. Deaner, R.O., et al. 2007. 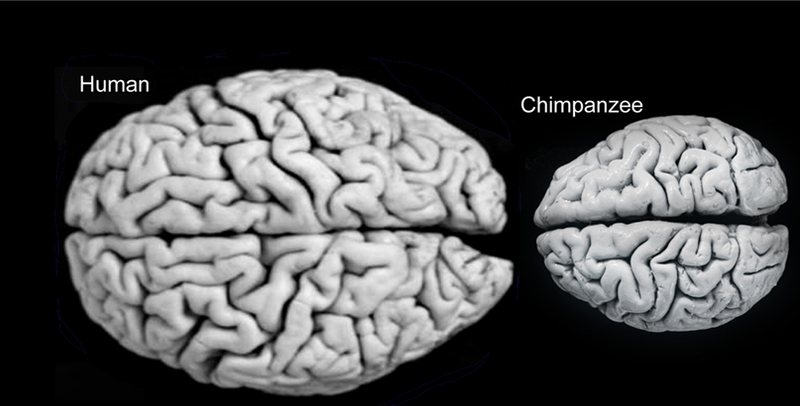 Overall brain size, and not encephalization quotient, best predicts cognitive ability across non-human primates. Brain, Behavior, and Evolution, 70: 115-124. Dunbar, R. 1993. Coevolution of neocortical size, group size and language in humans. Behavioural and Brain Sciences, 16: 681-735. Dunbar, R. 2003. The Social Brain: Mind, Language, and Society in Evolutionary Perspective. Annual Review of Anthropology, 32: 163-181. Grove, M. 2011. Change and variability in Plio-Pleistocene climates: Modelling the hominin response. Journal of Archaeological Science, 38: 3038-3047. Grove, M. 2012. Orbital dynamics, environmental heterogeneity, and the evolution of the human brain. Intelligence. Gutison, M., et al. 2012. Derived vocalizations of geladas (Theropithecus gelada) and the evolution of vocal complexity in primates. Philosophical Transactions of the Royal Society of Biological Sciences, 367: 1847-1859. Marino, L. 1998. A comparison of encephalization between odontocete cetaceans and anthropoid primates. Brain, Behavior, and Evolution, 51: 230-238. Sol, D., et al. 2005. Big brains, enhanced cognition, and response of birds to novel environments. Proceedings of the National Academy of Sciences of the United States of America, 102: 5460-5465. Sol, D., et al. 2008. Brain size predicts the success of mammal species introduced into novel environments. The American Naturalist, 172: S63-S71. Sol, D., et al. 2010. Evolutionary divergence in brain size between migratory and resident birds. PLoS ONE, 5: e9617. Trevathan, W. & Rosenberg, K. 2000. News and Views The Shoulders Follow The Head: Postcranial Constraints on Human Childbirth. Journal of Human Evolution, 39: 583-586. Look on my references ye mighty, and despair. Have been thinking about this publication for a while and cannot make peace with it. Looking at the bibliography, it is obvious the work was done by specialists, so it should be respected, but even that does not put the mind at piece. Seems there are serious inconsistencies. Basic question that comes to mind is the following:-If all human attributes are the result of natural selection, as predetermined by the ecological realities of the time and place ( i am of course also convinced this is the process) , how come we have developed attributes that gives our brains the ability to facilitate the development (for example) of complexities such as classical music, abstracted art, maths and the technological realities we are living with today. Is all of this just a logical spinoff of having to survive in a constantly altering climate, natural threats and formation of groups ? Why would a brain, and no other organ, develop to seven times the size nature dictates? Even in the Neanderthal and others, who lost the race. How come a bird can, with comparatively such a small brain, achieve tool manipulation that we consider rather awesome in primates and hominids? We know the bird is not the only other animal to have such capability. But, a top of that, a bird is not even a mammal ! The human is also not the only species to have survived. Much smaller brains also did, for much longer. No one can doubt that a bigger or better brain is a very valuable survival attribute. I have little doubt that this factor is one that put the Neanderthal at a serious disadvantage. It does seem logical that physical inability will result in some form of compensation. But the extent to which Sapiens compensated seems to pose a question. Does not seem as though the brain developed much larger sins very large group were formed ? And take note of the realities we experience today. Social chaos is not in short supply but technologically we are mastering space. The above postulations do not seem to add up to a complete explanation. They seem, however, partial explanations ? Nice summary and contrast between between the two hypotheses. Do you have any thoughts on the recent links made to pair-bonding (Dunbar & Shultz, 2007) and sexual selection (Schillaci, 2006). What do you think ofJoe Henrich’s cultural brain hypothesis? I like the meta-ness of it, our brains evolved to make memetic evolution easier. However, I am struggling with finding if there is empirical evidence for gene-culture co-evolution. Do you know any good sources? Can I encourage you into answering on CogSciSE if you do? It’s an interesting idea, and surprisingly one I haven’t encountered before. As such I haven’t had a chance to look into it as thoroughly as I would like, so take the following with as much salt as needed. At any rate it sounds plausible, but I’m somewhat weary of the evidence. For example, Homo erectus undergoes a fairly significant brain size increase, yet the fidelity with which they make tools doesn’t improve, as you might expect if Henrich’s idea was correct. One could say that other fidelity in other areas, like the manufacture of fire, but evidence of fire from this period is rather sketchy. Or maybe it was language or non-stone culture which improved, but then how do you study that? We do have more data for more recent periods, so his claims about later events to get more plausible. However, I’m a bit weary about claims regarding older culture given that we have limited evidence regarding it. For example, try the book “Coevolution: Genes, Culture, and Human Diversity” by William Durham. It goes over the evidence. The pictures seems to have fallen of this post? naw, it’s just the upright walking thing. We got up and could run all day, but gravity had our little pinhead babies bouncing against the door all day long, and the smallest ones weren’t making it to term before falling out into the world! The selective pressure was for cranial size, pure and simple. Once we’re born, we get by on that famous 15% – but the other 85% just kept us in Mom until our lungs were ready to work. Evolution is one of the mysterious ways in which the Lord works, and we should assume that he has plans for all that neural real estate in our heads some day! C’mon, ya gotta have a little fun with it too. The cervix does a pretty good job of keeping babies inside, regardless of head size. LOL – now you gotta show me an australopithicine cervix! It’s about the pelvises we’ve found, of course, right? I’m kidding, of course, but there was some mystery there, that the skull sizes leapt up before any smarter behaviour or something, some article a few years back. I’ll have a look, see if I can find it, but I tire of internet searches very quickly . . . and you probably know all about it anyway. The progress of encephalization is an interesting one. It appears to have been gradually increasing without any major behavioural changes. Once stone tools are invented it starts increasing even faster, but not necessarily at the same rate as technology.